The SEAROCK Ladies unmistakably embodies the characteristic and distinctive design for which the traditional Swiss ROAMER OF SWITZERLAND brand has been renowned since 1888. This new exquisite wristwatch combines classically elegant styling, reliable functionality and impeccable Swiss-made quality. Inspired by a legendary design from the 1970s, this feminine incarnation of the Searock men’s watch is now one of Roamer’s signature models. At this year’s Baselworld, ROAMER OF SWITZERLAND is presenting a line with the same name, the same inspiration, designed to appeal to sophisticated women: the Searock Ladies. 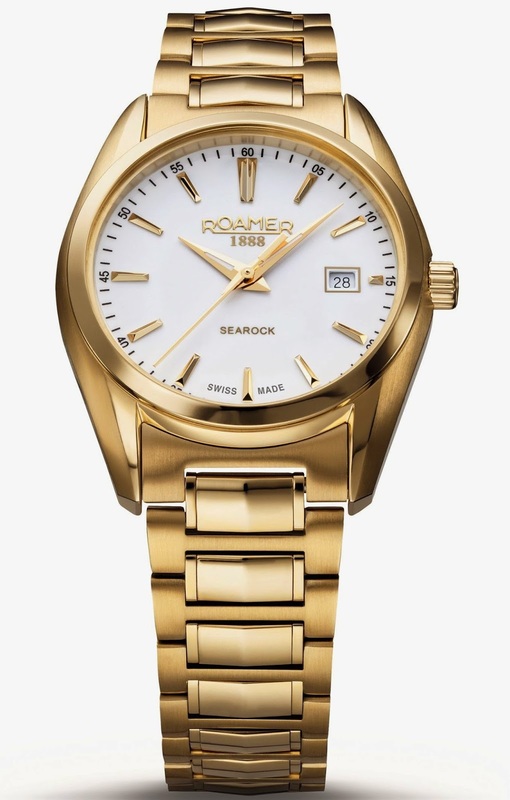 Fluent forms made of stainless steel give the SEAROCK Ladies its timeless appeal. The highly legible dial with applied metallised indices is surrounded by a stainless steel case that has a diameter of 30mm and is protected by an antireflective sapphire crystal. A Swiss-quality quartz movement guarantees this watch’s technical precision and reliability. Six variants are available in a selection of metal finishes including; pure stainless steel versions, stainless steel models plated with yellow or rose gold and white, black, blue or green dials to cater to a wide spectrum of moods and stylistic statements. White, black, blue or green; applied indices; date window at 3 o’clock.